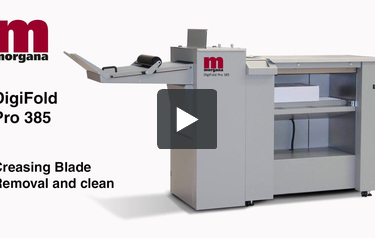 The Morgana DigiFold Pro 385 is a high speed creaser and folder with fully automatic setup and deep pile feeder. It is specifically designed for digital and litho printers who have a need to crease and fold digitally printed, heavy weight or cross grained stock. It is equipped with the very latest in technology to enable automatic set up of jobs, including setting of all feeder functions and fold roller settings, by selecting just a few simple parameters on the Morgana SmartScreen touch screen control. The new deep pile feeder allows stacking of up to 17.72" of paper to enable longer runs and is equipped with a SmartStep table drop for fast loading of shorter run jobs. Paper feeding is controlled by a new vacuum top feeding drum that can automatically change between a wide range of paper types and thickness with little operator intervention. The DigiFold Pro 385 is equipped with a Dynacrease blade and matrix, to allow the highest speed when creasing and folding, and with a fixed blade and matrix for crease only mode. This allows operators to select the widest range of applications to be produced from the SmartScreen with all other functions being set automatically. The unique DynaCrease system places creases into the stock whilst running to an accuracy of +/- 0.004". 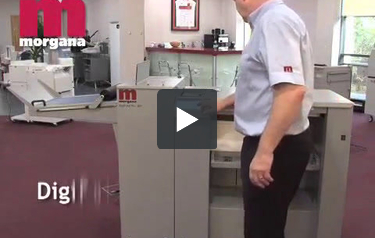 This system allows us to produce at up to 6000 sheets per hour. The DigiFold Pro 385 can be used as an integrated creaser/folder performing both functions in a single pass, as a stand-alone creaser when folding is not required, or as a perforator when creasing and folding are not required. Up to five perforation wheels can be fitted across the width of the sheet. The DigiFold Pro 385 is simplicity itself…the quickest of set up times with virtually no wastage, allowing the user to improve their productivity and quality immediately. Crease and fold sheets up to 0.02" without cracking. Intuitive SmartScreen touch screen control. Deep pile 17.72" capacity feeder. Patented flying knife folding mechanism. Max sheet size - 15.16" x 27.5". Creasing blade and matrix guaranteed for life. Maximum sheet size: 15.16" x 27.5"
Minimum sheet size: 8.25" x 5.51"
Minimum repeat crease distance: 0.04"
Minimum crease distance from lead edge: 0.1"
Minimum crease distance from tail edge: 0.1"